(left) Jackie Chan as the Drunken Immortal, and (right) Jet Li as the Silent Monk in The Forbidden Kingdom. The Skinny: The long-awaited Jackie Chan-Jet Li collaboration probably isn't what martial arts fans from around the world have been waiting for. Still, this American love letter to Hong Kong Cinema delivers an entertaining, if all-too-safe night at the movies. Despite its many faults, The Forbidden Kingdom boasts spirited, consistently funny performances from its two superstar actors as well as a winking self-awareness that strikes just the right tone. Who do you think would win in a fight: Jackie Chan or Jet Li? I'm sure plenty of Hong Kong Cinema fans, both young and old, have posed that question to one another at some point in their lives. Of course, that type of question isn't new. The names might change over the years, but the impulse will always remain – that adolescent desire to debate who the best man really is, especially when it comes to larger-than-life heroes. In comic books, those fantasies usually get fulfilled via guest appearances in a particular character's comic or through inter-company crossovers. But in films, those kinds of pairings aren't so common. Movie studios might bankroll flicks like Frankenstein Meets the Wolfman, King Kong vs. Godzilla, or Freddy vs. Jason, but when it comes to pitting two honest-to-goodness, "in their prime" action stars against one another, it almost never works out. The timing is never right, the actors have prior commitments to other projects, or there are just too many egos at play. With that said, The Forbidden Kingdom has been a long time in coming. Most American audiences weren't familiar with either of the film's marquee names until Jackie Chan hit the box office jackpot with the first Rush Hour and Jet Li stole the show in Lethal Weapon 4. And that was ten years ago. By then, many Hong Kong cinema fans had already given up hope for a team-up thanks to a little movie called High Risk (1995), in which Jet Li played bodyguard to a thinly-veiled Jackie Chan parody who not only didn't do any of his stunts, but was a coward to boot. But apparently Chan didn't hold a grudge against Li. In 2006, the “J & J Project” was announced, and details started leaking to the public about its content. This news should have thrilled Hong Kong Ciema fans, but both Chan and Li were hardly in their prime. Was the film some 10-15 years too late? And besides the age issue, there were a number of facts about the production that were cause for some alarm. Rather than a recognizable Hong Kong name, the director is Rob Minkoff, whose last work was Disney's The Haunted Mansion. The film's dialogue is mainly in English instead of Cantonese, the de facto protagonist is actually a white kid from Boston, and - sin of sins - the film's distributor is none other than the infamous Weinstein Company, whose relationship with Asian cinema is questionable at best. Is this really the movie that martial arts films fans have been waiting for? Probably not. But that doesn't mean The Forbidden Kingdom doesn't have its charms. The film centers on Jason Tripitikas (Michael Angarano), a HK film fanatic who spends his free time visiting a dusty Chinatown shop in search of rare martial arts DVDs. The owner of the place is Hop, an elderly man with a wicked sense of humor. Hop also has the magical staff of the legendary Monkey King (Jet Li) in his possession, and Jason soon finds himself thrown back in time. His mission? Return the weapon to its rightful owner, who just so happens to have been encased in stone for the last 500 years. Oh, and in this mythical version of China, people speak Mandarin, but Jason conveniently hears them in English – as do we, at times. Jason soon meets Lu Yan (Jackie Chan again, but with dreadlocks), a drunken martial arts master who claims to be the Eighth Immortal of Chinese legend; a stoic monk (Jet Li again, but human); and the beautiful Golden Sparrow (Crystal Liu Yifei), a vengeful young woman who, like The Rock, likes to speak in the third person. Looking to recapture the staff for their own purposes and defeat this rag-tag band of heroes are the Jade Warlord (Collin Chou, a.k.a. Donnie Yen's punching bag in Flashpoint, here wearing some ridiculously silly mascara) and Ni Chang (Li Bing Bing), a white haired, whip-wielding devil woman whose character should be familiar to any true fan of Hong Kong cinema. Along the way, Jason learns some life lessons, hijinks ensue, and Jet Li and Jackie Chan finally fight onscreen. But is it any good? As much as one might be tempted to bash The Forbidden Kingdom for what it isn't, it's really only fair to critique the film for what it is. And in this case, we are dealing with a wide-eyed American kid's movie that surprisingly treats Hong Kong Cinema and its two greatest living stars with the utmost respect. This isn't Drunken Master 2 or Once Upon a Time in China-level stuff, although I'm fairly sure that's what the filmmakers were striving for. The movie instead contains an onslaught of Hong Kong Cinema references that would put even Quentin Tarantino to shame. From the inclusion of the Shaw film Monkey Goes West on Jason's TV screen to the stylized Shaw Bros/Bruce Lee poster art tribute that makes up the credit sequence to the Touch of Zen-style bamboo forest, The Forbidden Kingdom is a film that consistently pays homage to its roots. Furthermore, unlike The Last Samurai and its ilk, The Forbidden Kingdom knows precisely what it is, and isn't afraid to a) acknowledge it and b) make fun of itself for literally being a white boy's kung fu fantasy come to life on the big screen. 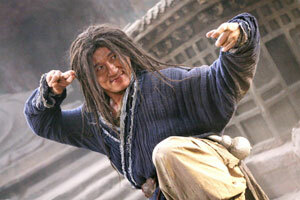 This propensity for self-critique is achieved in large part due to the comic performance of Jackie Chan. Refreshingly, the filmmakers dispense with the innocent Jackie Chan persona that most American fans are familiar with, and instead make Lu Yan smart, cynical, and sharp-tongued, and Chan delivers a winking performance that helps the film hit just the right tone. As Jason, Michael Angarano looks awkward and confused through most of the film, and his character's lack of any American bravado makes the whole plot seem a lot less offensive than it is on paper. In most American films, the Asian master is relegated to a secondary, supporting character – people want to be Ralph Macchio or Jean Claude Van Damme winning the big final duel. By the end of The Forbidden Kingdom, nobody will want to be Michael Angarano, they'll still want to be Chan or Li. Speaking of Jet Li, he effectively channels Liu Xiao Ling Tong's famous interpretation of Sun Wukong for his own performance, a feat that was both amusing and quite exciting for me, a diehard Monkey King fan for as long as I can remember. And while Li is suitably dour as the oh-so-serious monk, I should be clear that The Forbidden Kingdom is by no means a Fearless or Warlords-level acting stretch for Li. But then again, if it was, we probably wouldn't have been able to witness the film's hilariously over-the-top "raining" sequence between Li and Chan. It's the kind of ribald silliness that comes directly from Journey to the West and old school Hong Kong cinema. As far as the other actors are concerned, Liu Yi-Fei acquits herself well in the role of Golden Sparrow, the character made famous by Cheng Pei-Pei in Come Drink With Me and its sequel. Collin Chou, however, is only so-so as the villainous Jade Warlord, a baddie so generic that you almost wish it was Donnie Yen who was swishing around in that ridiculous mascara. The real scene stealer is Li Bing-Bing, who is so mesmerizing as Ni Chang that I'd happily welcome the prospect of a third Bride with White Hair movie if she was cast in the lead. But what about the Yuen Woo-Ping directed fights? That's what people came for, right? And what of the Jackie Chan/Jet Li confrontation especially? That long-awaited fight is surprisingly extensive and amusing - especially when the two actors start trying out animal styles - but it's predictably inconclusive and, like many of the fights in The Forbidden Kingdom, feels a bit routine. It also doesn't help that the dialogue can sometimes be terribly clunky. Note to filmmakers: Chinese actors should not be asked to communicate pages of exposition in their non-native language, especially clichéd hokum that plays fast and loose with Chinese mythology. The character arcs are bit too familiar, the pacing is sluggish at times, and the music isn't as rousing as it should be. For a martial arts tribute, the film seems awfully generic. Kung Fu Hustle this ain't. Notes:  Jason's last name is a reference to Tripitaka, the monk who set out to India to bring the Buddhist scriptures to China.  Reportedly, in the Cantonese version, the characters in the Boston sequences speak English, while the characters in the “Forbidden Kingdom” scenes speak Cantonese, including Jason.